Let’s celebrate – it’s Rose Festival time!! - Amphora Aromatics Ltd – Supplier of pure essential oils and aromatherapy Products. It’s Rose Festival time!! We’re celebrating the rose harvest in the Bulgarian ‘Valley of the Roses’ where, in just a few weeks, more than 1,500 kilograms of oil is distilled from roses or ‘Rose Damascena’ – enough to supply most of the world’s cosmetic, perfume and aromatherapy industry. Our 100% pure Amphora Aromatics’ Organic Rose Water is produced here, on the southern slopes of the Balkan range and Sredna Gora mountain, using only flowers from certified, chemical-free organic rose fields. Known as ‘hydrolate’ – the result of the distillation process of organic rose oil – we supply around 25,000 kg of organic rose water to our customers as a cleansing skin toner, body mist spray or simply to add to the bath, for a calming and fortifying effect. One kilogram (kg) of rose oil is extracted from around 3000 kgs of roses, all harvested by hand. This rose oil is Bulgaria’s ‘liquid gold’. In the first week of June, the whole valley dresses up in rose flowers, dances, sings and parades along the sweet-scented streets to celebrate the harvest and elect a Queen of Roses. Over the six-week harvest period collection begins at sunrise when the oil yield is at its highest and is completed before noon, while the dew is still on the flowers. The harvest is packed into sacks and transported immediately to the nearby organic distillery where they are distilled by the end of the day – ensuring the essential oil and water’s superb quality and unique aroma. 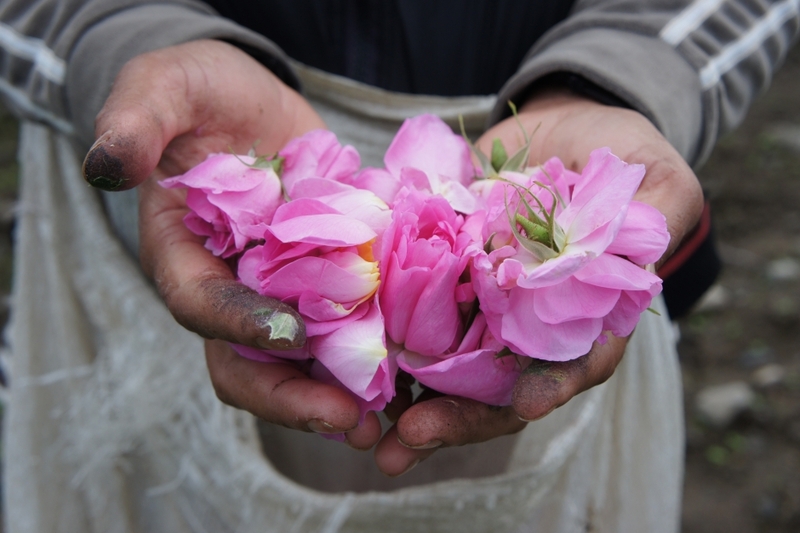 For more than 300 years, the people in the ‘Valley of Roses’ have grown roses and processed them into rose oil in this way. The favourable climate, with its characteristic mild winters and a long, balmy spring, with intermittent light rains, high humidity - especially in May and June - abundant morning dew and undulating landscape, are ideal for growing the oil-yielding rose and creating its outstanding aroma. Visit www.amphora-aromatics.com to find our more or order our Organic Rose Water (Hydrolate) from the Valley of the Roses. RRP £6.96 for 200ml.